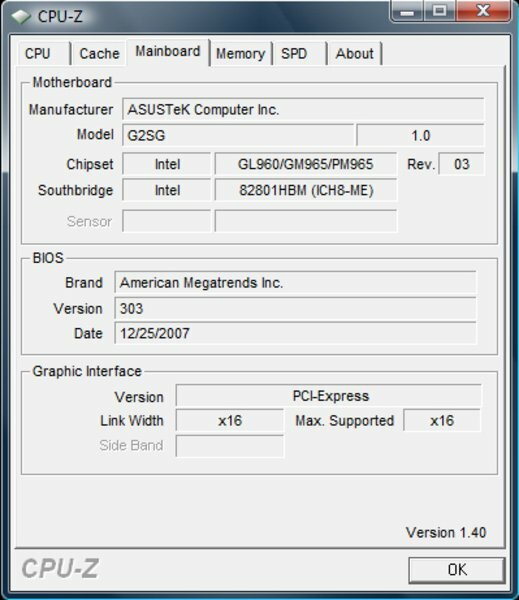 Since the launch of the Asus G2 after the Cebit 2007, it has been offered in various configurations to keep it competitive. 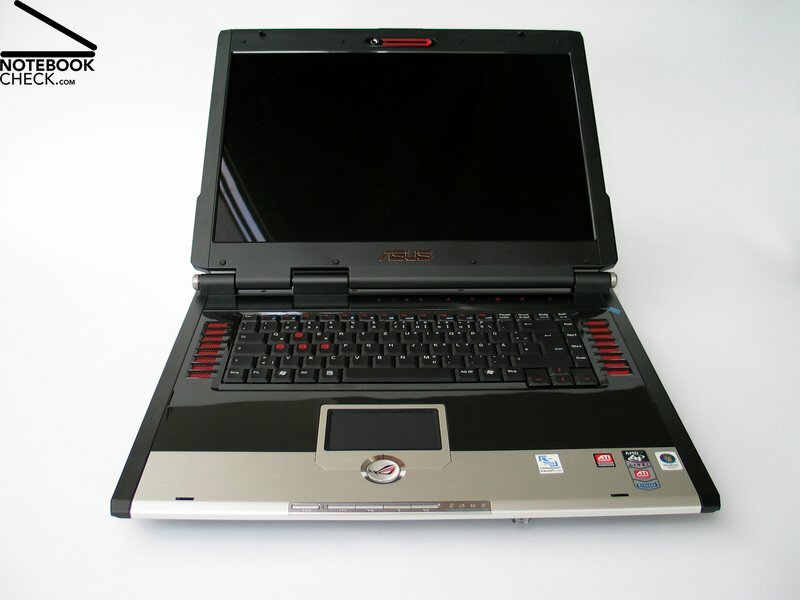 The current version of the gaming notebook in 17" format, called G2SG, comes with a new Penryn processor and a Geforce 8700M GT graphics card made by nVIDIA with 512MB GDDR3 video memory. The Asus G2SG's case, input devices and display (WXGA+) are identical with the already reviewed Asus G2K notebook. Please consult the test of that model for additional information. 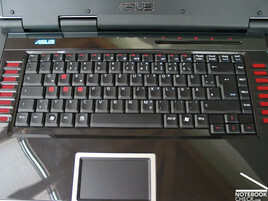 The picture of the following review, apart from the display shots, are from the review of the Asus G2K as well. The case of the Asus G2SG mostly stands out because of it's rather unique design that might not be everyone's taste. 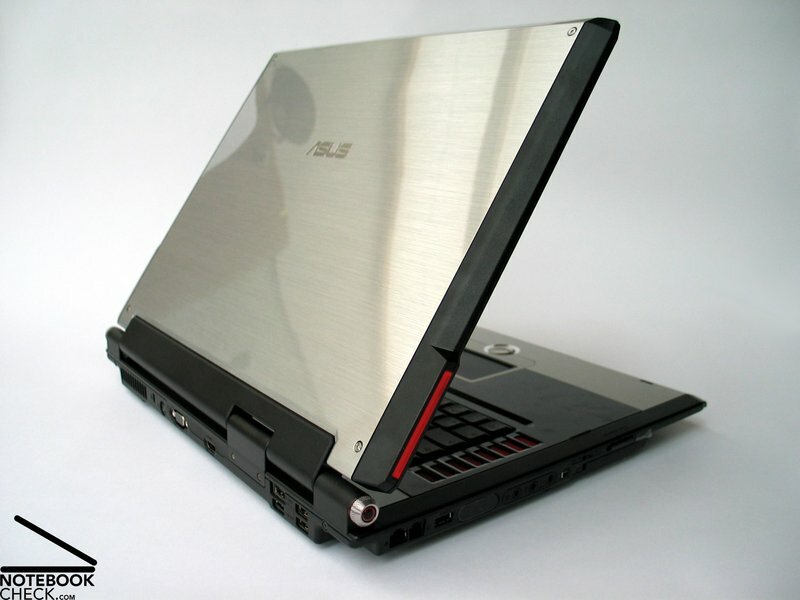 Asus achieved this by combining a variety of different materials with outstanding colour design. Almost all materials that can be found in other models can be found here as well: plastic in matt finish, plastic in glossy finish, plastic in carbon and aluminum look, as well as actual metal below the keyboard, and the perforated iron sheet on the left and right of the keyboard. 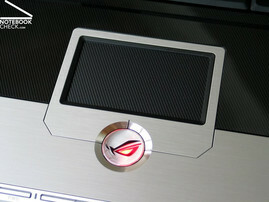 Those who like such a collection of different materials will be very pleased with the Asus G2. But it might not be the best choice for people who prefer italian minimal design. However, the colourful case with all the blinking lights impresses with stability and robustness. The Asus G2SG weights about 4kg and promises a long life, due to it's relatively pressure resistant and flexural rigid case. Especially the display hinges need to be mentioned in this regard: They not only look massive, but actually keep the 17" display so strongly in position, that it needs some power to move the display into the desired position. As a mobile gaming device the Asus G2SG offers a variety of high value interface options. The G2SG, like the model G2K, has Firewire, VGA and S-video output, a digital HDMI port, as well as a total of five USB 2.0 ports (one of them is also used as eSATA interface to external hard disks). This is not all. The notebook's audio ports include a Line-In port, microphone input, and earphone exit respectively a S/PDIF port. Due to the hybrid TV-tuner (analog and DVB-T), which was integrated in our test sample, the notebook also had an antenna connection for the indoor antenna that is included in the shipment. Further included is a composite port, which offers together with the also included adapter further connection options (audio and video input). Whether the alignment of the ports is good or bad depends mainly on the requirements of the user. 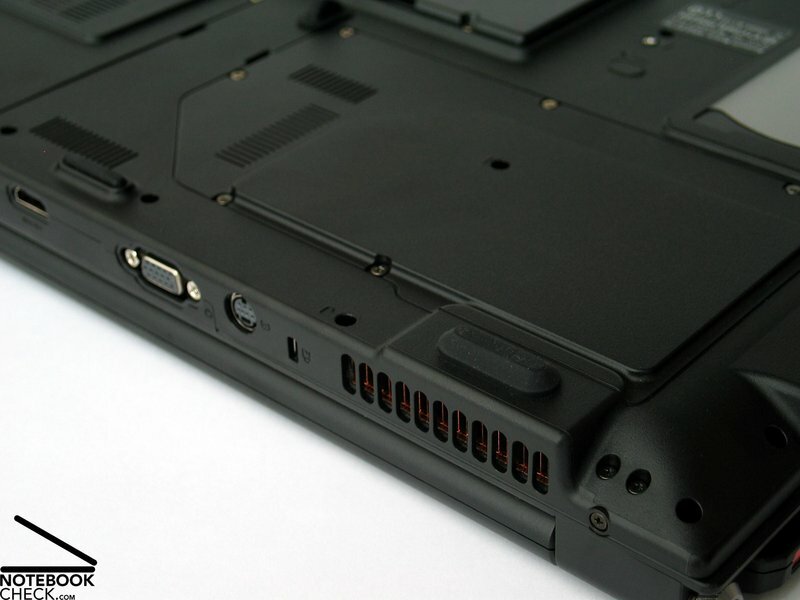 The connections are mostly on the back or left of the laptop. Not really optimal is the separated position of the LAN port (left side on the back) and the power supply (right side back). Furthermore, most of the USB ports are on the back, which makes them more suitable for stationary devices that are left plugged in. The Asus G2SG communicates over a Gigabit Ethernet interface by Atheros (10/100/1000 Base-T controller) and an Intel wireless 4965AGN module. The G2SG further has Bluetooth and an integrated 56k modem. 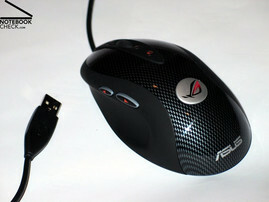 Impressive is also the accessories that come with the Asus G2SG. Apart from the familiar backpack in Asus G2 gaming style and the fitting Logitech MX 518 optical mouse, the shipment also includes a variety of adapter cables, a DVB-T antenna, and a remote control with the IR controller to connect it to the notebook via USB. 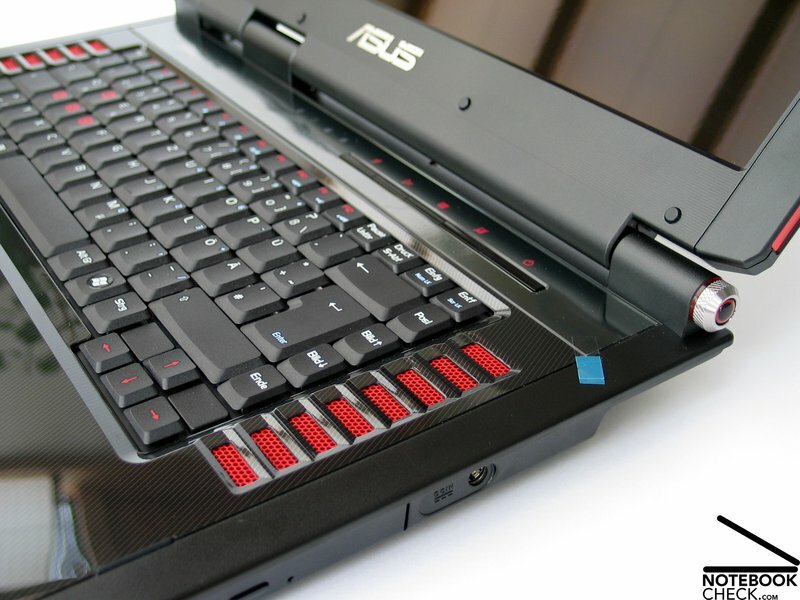 The coloured A-W-S-D keys of the keyboard, which are used to move characters in games through virtual worlds, leave no doubt that the Asus G2SG is indeed a gaming notebook. An additional number pad is not included in order to keep the size of the standard keys comfortable large. Typing feeling is good with clear feedback. 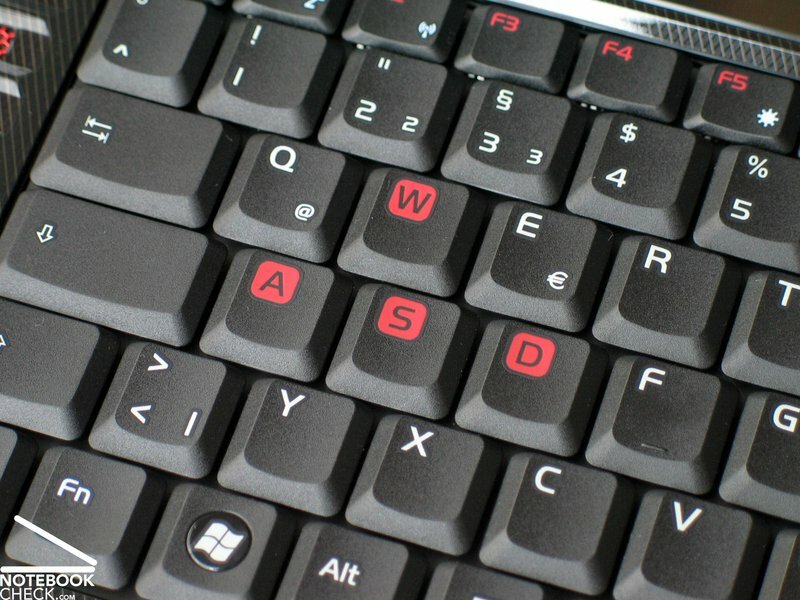 The keys leave a generally robust impression, but can be pressed trough a bit too much around the enter key and tend to rattle when typing forcefully. Missing hot keys to change the volume was sometimes negatively noticeable while playing games. One has to use the key combination FN+F11/F12. You can find more information about the keyboard and touch pad here. The Asus G2SG (7R014J), like the model G2K which we've already tested, has a 17 inch WXGA+ display with a maximum resolution of 1440x900 pixel. Although this limits the amount of things visible on the screen, it makes it possible to play at least older games at native resolution. More about this later in the performance tests. 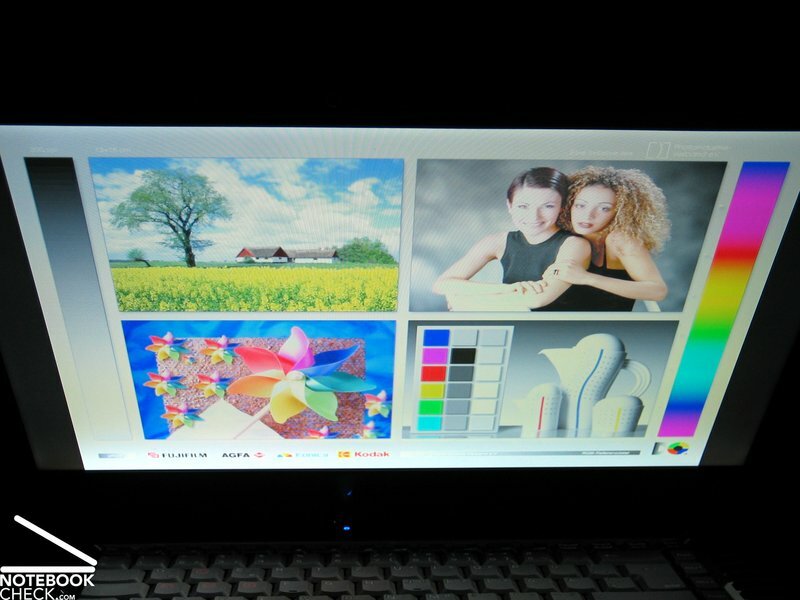 The picture quality is mostly influenced by the subjectively noticeable high display brightness. Colours and contrast make a good impression as well. 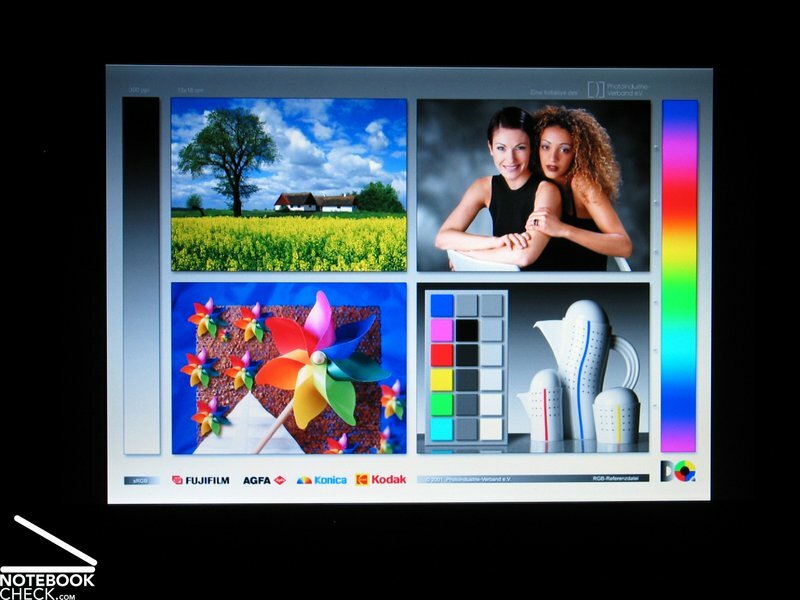 In the display brightness test the panel achieved a maximum of very good 338cd/m2 in the central area of the display. 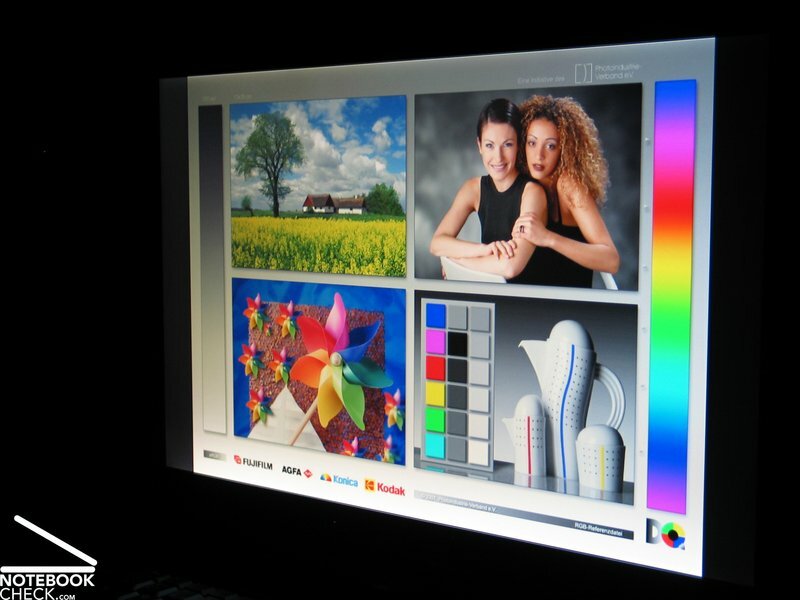 The drop in brightness to 275cd/m2 in the upper corners results in a display illumination of 81.4%. 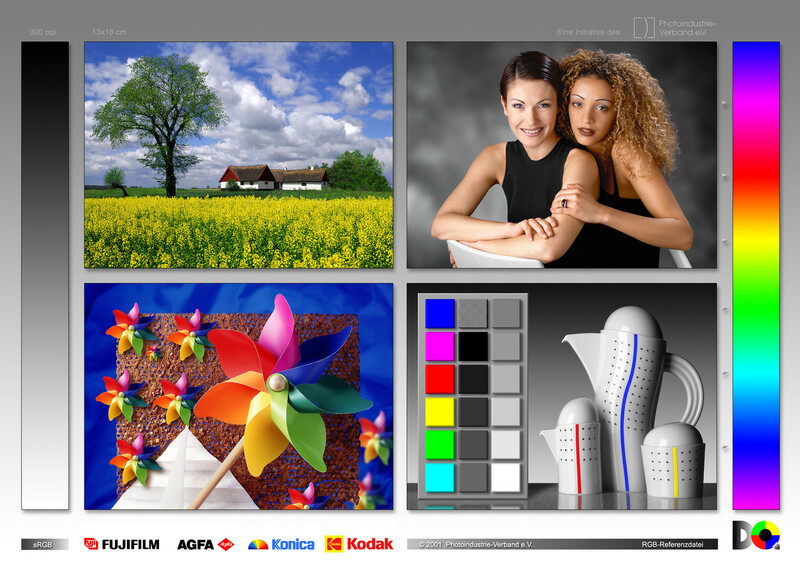 The very good impression of the image quality is also supported by the contrast ratio. A very low black value of 0.48cd/m2 and the very good brightness are responsible for an excellent contrast of maximal 704:1. 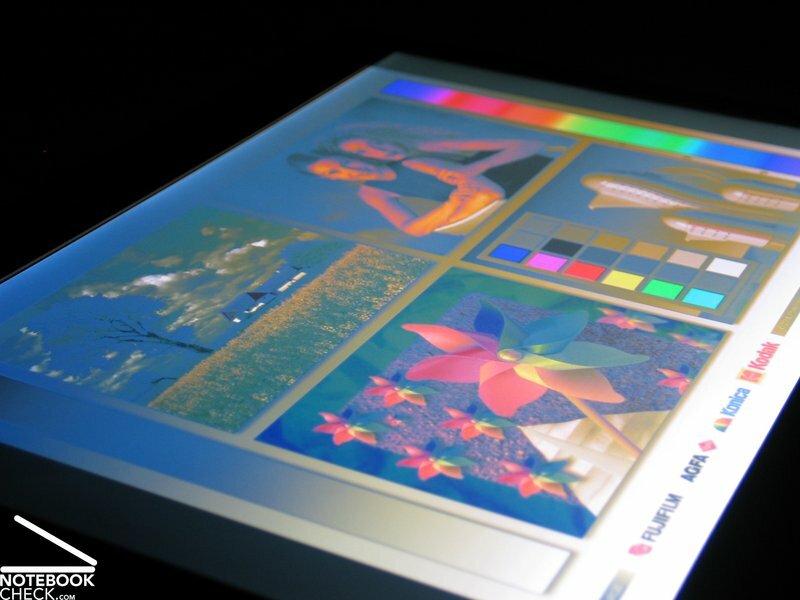 Even though the display uses a panel with glossy surface (color shine glare type), it only causes minor reflections (especially if the screen content is dark) indoors, due to it's excellent brightness. It can't really be recommended for outdoor usage however, because of sun reflections on the display. 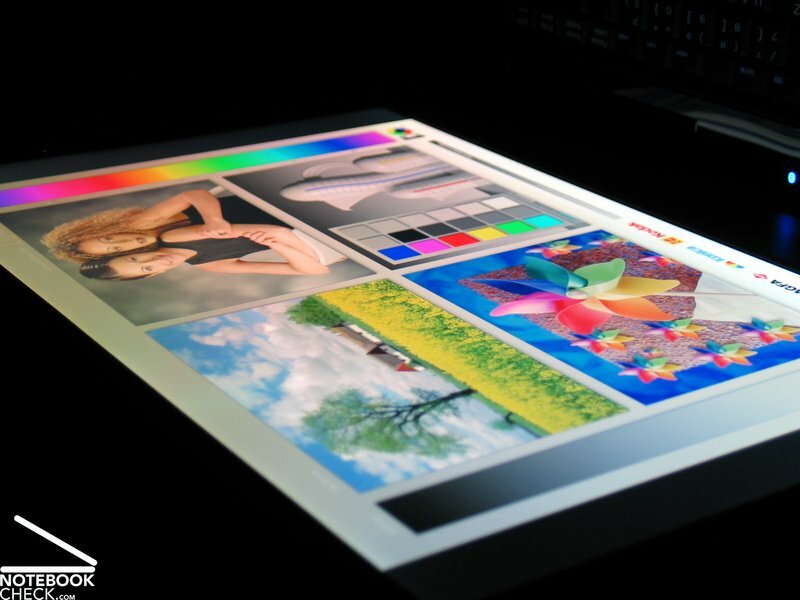 Although the Asus G2SG offers a wide enough possible viewing angle to provide a sufficient large working area while the notebook is used stationary, the image will change the more one moves away from the optimal viewing angle. 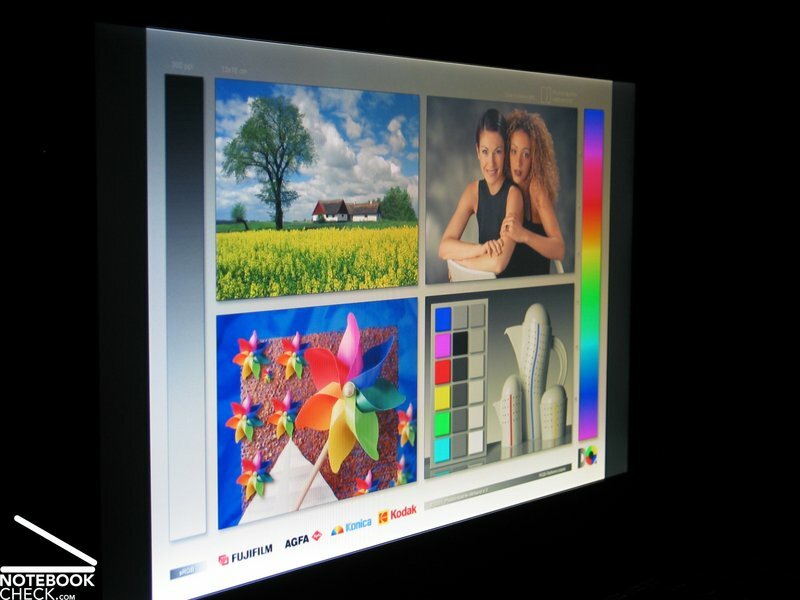 This becomes apparent with a darkening of the screen when moving in vertical direction and a change in colour, as well as more reflections when moving in horizontal direction. 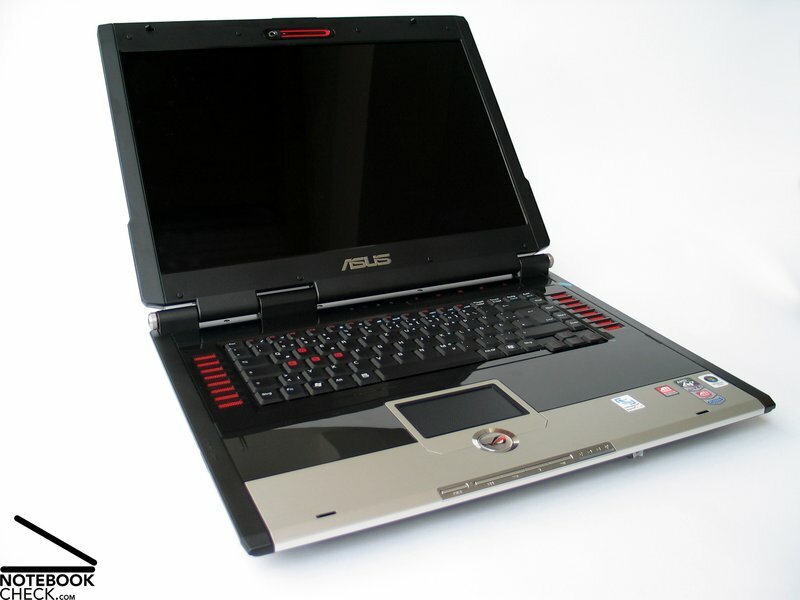 The Asus G2 type G2SG-7R014J has a modern Penryn processor made by Intel, a powerful T9300 chip with a clock rate of 2.5GHz and 6MB L2-cache. This gives the G2 the advantages of the new Penryn processors, which can offer significantly better performance in certain applications compared with Merom processors running at the same clock rate. More about this in our special report about the current Penryn processors. The G2SG also got a new graphics chip, the Geforce 8700M GT with 512MB GDDR3 video memory. The 8700M GT is trailing the 8800 GTX and various SLI combinations, but still belongs to performance class 1 in our comparison of mobile graphics cards, which indicates good performance for this graphics card. As a result, the G2SG is clearly ahead of the G2K with Turion processor and ATI graphics, and also stays ahead of the new middle class graphics card, the Geforce 9500M GS in the Asus M51S. As mentioned before, some SLI combinations (8600M GT and 8700M GT), as well as the currently most powerful notebook graphics card, the 8800M GTX, are still ahead. The good performance of the Asus G2SG comes not only from the processor and graphics card, but also from other high quality hardware components. 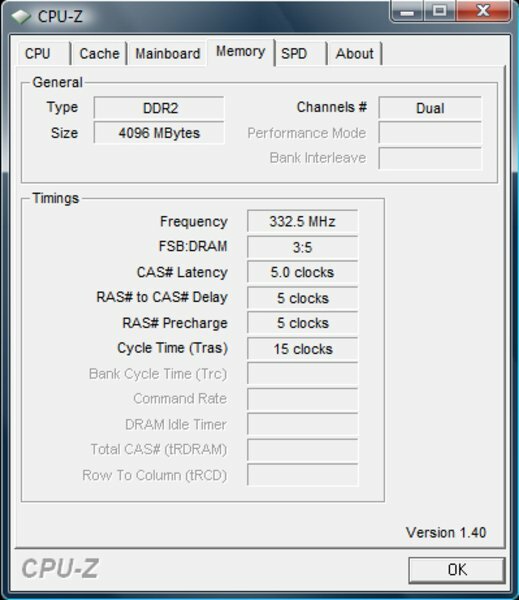 The G2SG is equipped with a total of 4096MB (DDR2, PC5300, 667MHz) system memory, divided into two 2GB memory sticks. Windows Vista Ultimate 64-bit is installed in order to make use of this memory capacity. 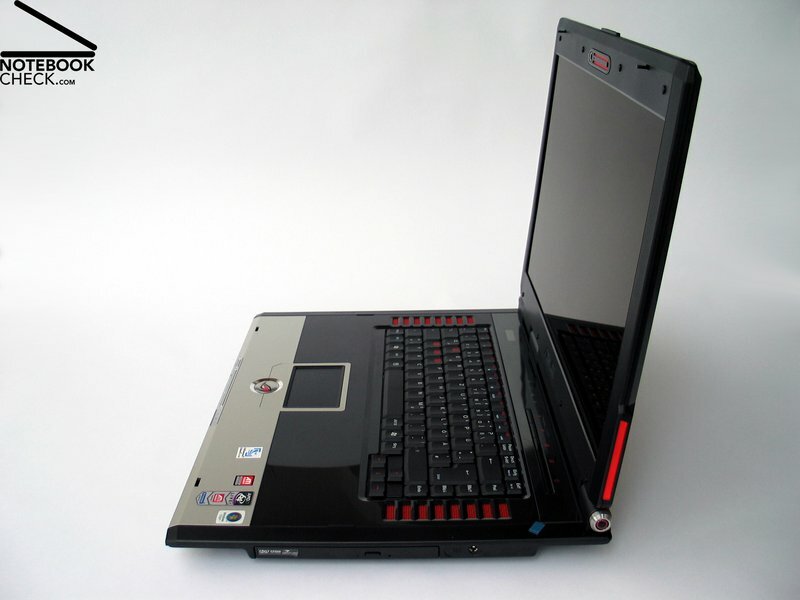 According to a comparison between Vista 32-bit vs. Vista 64-bit in the review of the Nexoc Osiris E705III gaming notebook, there were no noticeable performance differences that could be attributed to the 64-bit system however. Furthermore, the Asus G2SG contains the much advertised and hotly discussed Intel turbo memory module, also known as Robson, which stores frequently used data and is supposed to offer faster access than the hard disk. Opinions vary widely whether and how much of a performance difference it makes, but we couldn't notice any difference in various tests. There was no doubt about the very good performance of the hard disk however, a 320GB hard disk made by Western Digital type WD3200BEVT-22ZCTO. 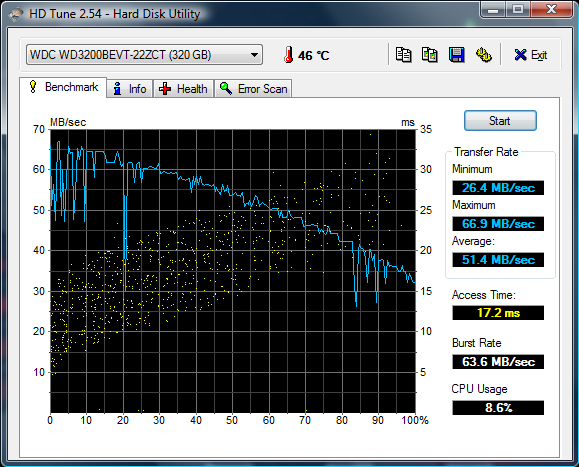 With an average transfer rate of 51.4MB/sec and an access rate of 17.2ms in the HDTune benchmark test, this hard disk with a speed of 5400r/min presents itself as well performing data storage. The hardware equipment offers not only good performance in 3D benchmarks, but can also convince in applications. The test system achieved excellent 6174 points in the PCMark 2005 benchmark test, and moved with this result clearly ahead of numerous comparable notebooks. 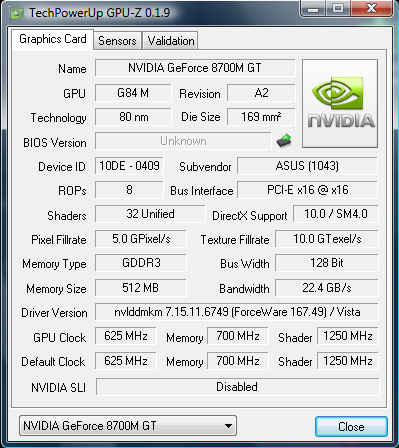 The same can be said about the Cinebench R10 benchmark test, where the Asus G2SG did also well. However, while it managed very good results in rendering (single and multi processor), it showed some noticeable weaknesses in the shading test, where notebooks with the optimised Quadro FX graphics card do clearly better. 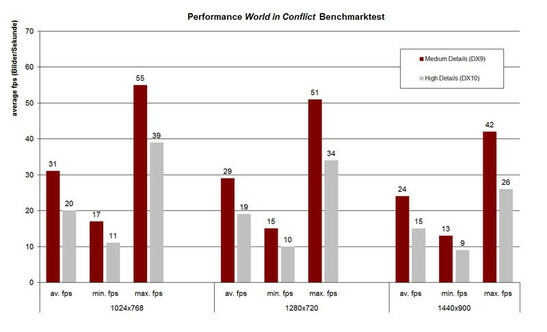 But this isn't much of a problem since the Asus G2SG target audience is probably more interested in gaming performance. A notebook that titles itself as "the ultimate gaming notebook" obviously pushes expectations up. It did pretty well in the 3D Mark benchmark test, but how is the situation when playing real games? We want to explore the practical performance of the G2SG using a variety of current games. We start with the currently most discussed game made by Crytek and published by Electronics Arts. The first person shooter Crysis is well known for bringing even high end gaming computers to their knees, and forcing players to sacrifice resolution, detail level or both. 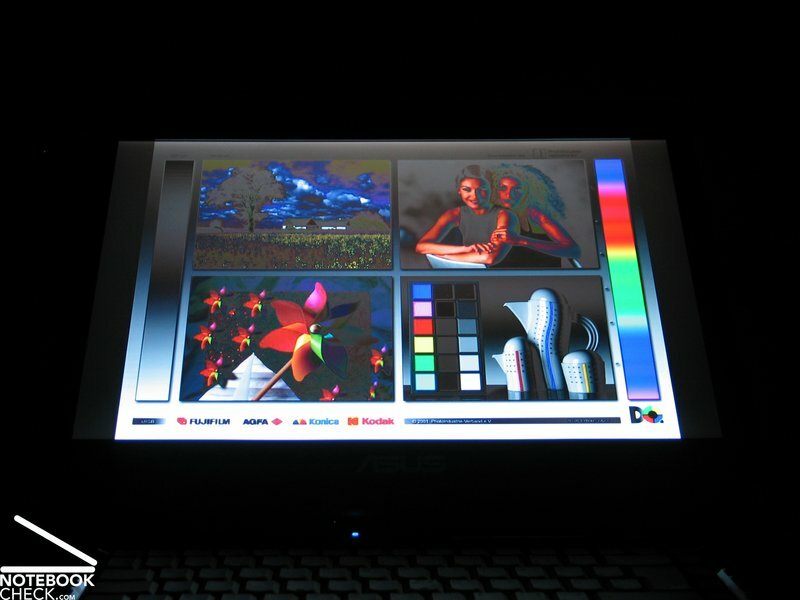 The fact that the Asus G2GS isn't a high end gaming machine became already apparent from the 3D Mark results. 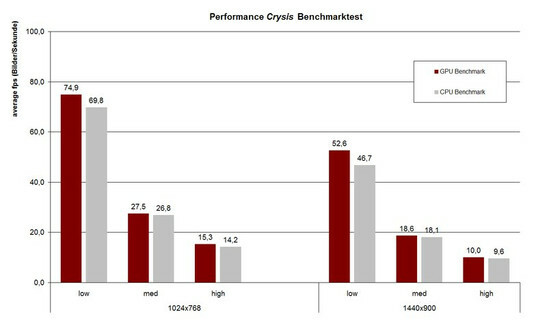 But Crysis' benchmark result is still rather disappointing. Even with medium details and a reduced resolution of 1024x768 pixel, it only manages 27.5 frames per second (fps) in the graphics cards benchmark test. The game itself shows a similar result when playing the Crysis demo level with the same settings the frame rate was between 15 and 35, so an average of 25 fps. The game was playable, but effects would frequently cause frame drops. 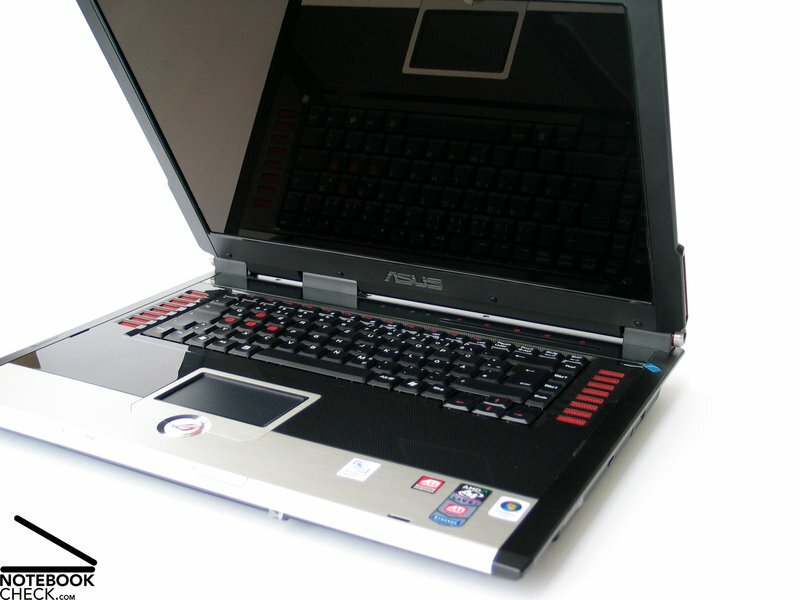 The Asus G2SG notebook also achieved only modest results in the real time strategy game World in Conflict. The average benchmark frame rate with medium details (DirectX9) and 1024x768 pixel resolution was 31 and dropped to 24 with the native resolution of 1440x900. With high details (DirectX10) it went even lower and stayed around 15-20 fps. The notebook achieved in the practical test on the map Seaside in a 3 vs. 3 multiplayer game with the settings 1440x900 and medium details 30-40 fps. This is enough to play the game properly. Also included in the test was one of the currently most popular games, Call of Duty 4 - Modern Warfare. The practical test in single player modus first level, with the settings 1280x768, anti aliasing deactivated, and the other settings on default, resulted in a smooth gameplay with 50-60 fps. Even with the native resolution of 1440x900 pixel the game was still well playable with 40-50 fps . Unreal Tournament 3 is another first person shooter in our test selection. The test of the demo on the map Heat Ray, with a resolution of 1024x768 and detail levels on default (texture level 3, world detail level 3, VSync off) ran with smooth 55-63 fps. However, increasing the resolution to the maximum of 1440x900 reduced the frame rate to 38-55. The frame rate dropped further, to 30-42 fps, when maximum details were selected. The last game in our test is the current version of the real time strategy game Supreme Commander - Forged Alliance. 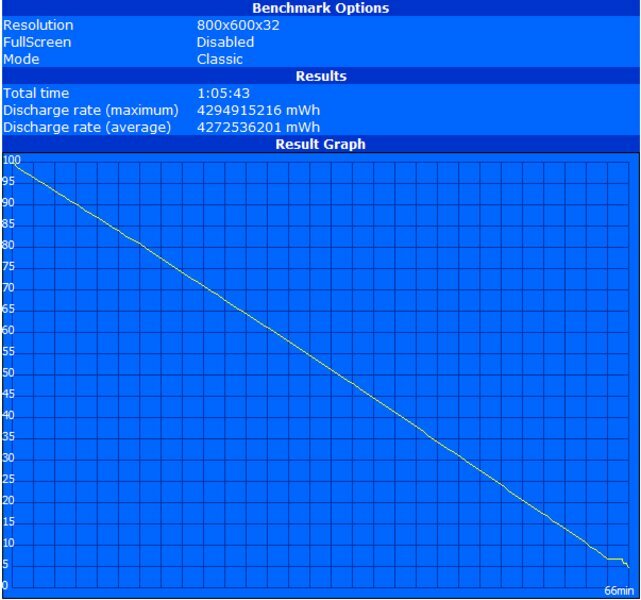 The G2SG scored 15645 points in the benchmark with the following settings: 1440x900, medium details. A practical 2 vs. 2 game with the same settings resulted in 15-20 frames per second. A reduction of the resolution to 1024x768 improved the frame rate to 20 fps. The game was in both cases playable. Generally we attest the Asus G2SG sufficient gaming performance, but we wouldn't really call it "the ultimate gaming notebook". For that it needed proper DirectX10 support with acceptable frame rates, which the Asus G2SG couldn't provide in the tests. 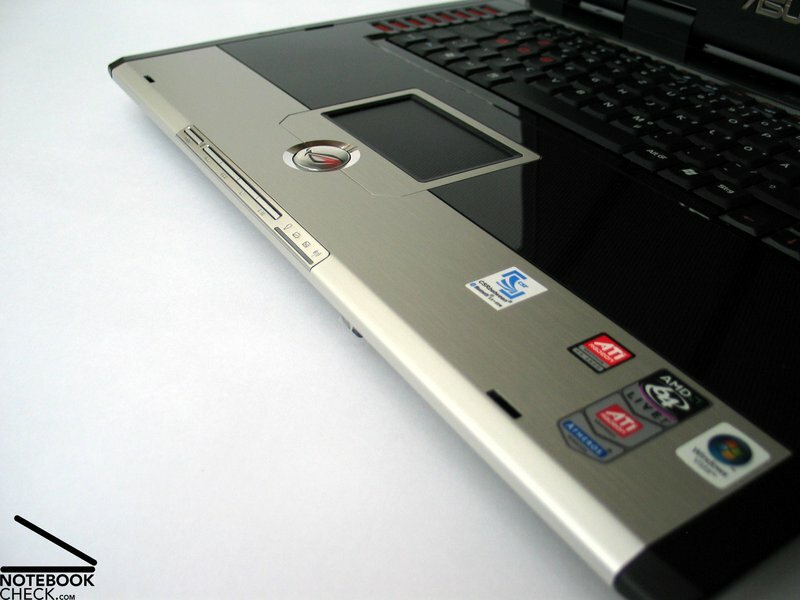 The G2SG is thus an average gaming notebook, which can run current games, but only with reduced detail levels. One of the distinctive features of the Asus G2K was it's quietness, which can't be said about the current model, the G2SG, which is significantly noisier. This is not surprising, given the relatively powerful hardware components. Fortunately, the Asus G2SG stays at least in idle and low demand office mode with applications that don't need much performance, like e-mail or internet, very quiet. With only 32.2dB(A) there is no reason to complain. If the Asus G2SG is under load, for example while playing games, the fan starts to turn faster. Depending on the game and load, the noise level can go from 40.6dB(A) up to maximal 45.4dB(A). The maximum noise level can be described as annoying, and requires either very exciting gameplay or loud sound to push it in the background. There is of course also the possibility of earphones for very sensitive ears, which should prevent the user from hearing the fan altogether. 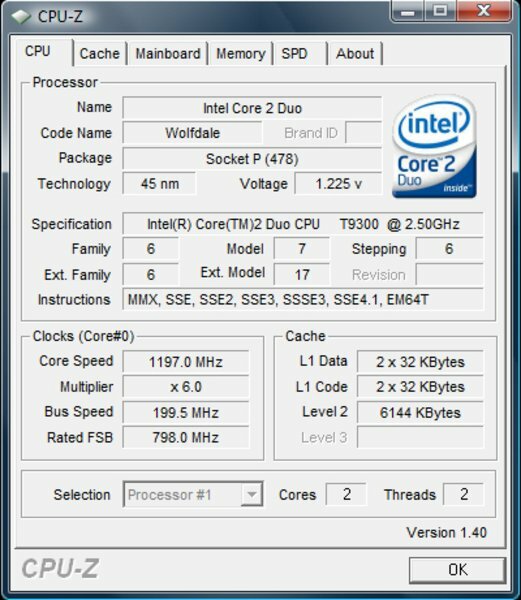 The Asus G2K stood already out with very high surface temperatures. But while the temperatures of the Model G2SG are slightly higher, the distribution of the surface temperature stays similar. 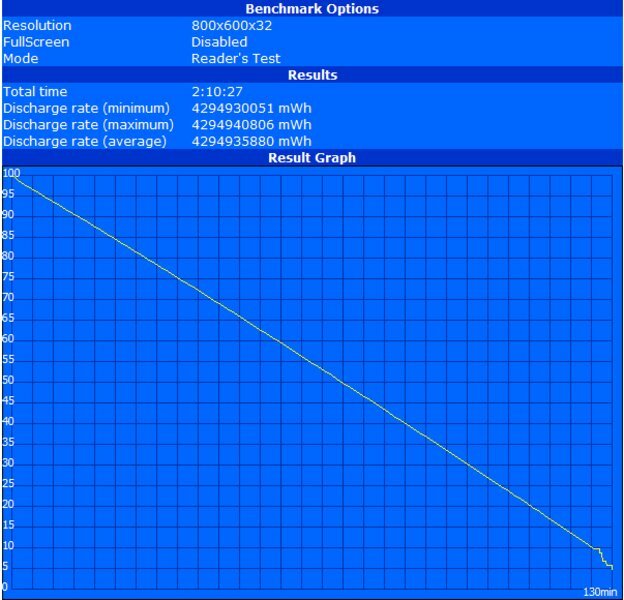 With 48.9°C under load the Asus G2SG achieves an impressive maximal temperature, which suggests a stationary use of the notebook. 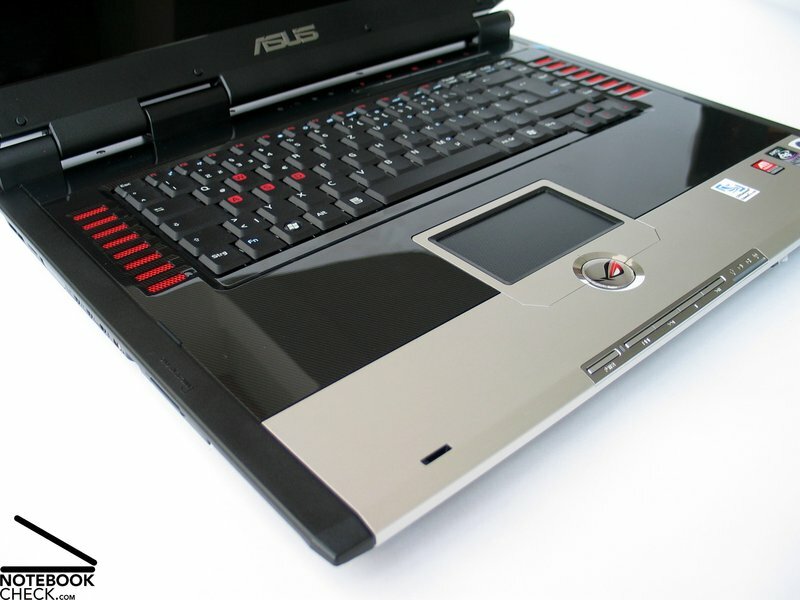 Although the two holes, which are covered with red painted and perforated metal sheets, on the left and right of the keyboard look at first glance like the positions of the loud speakers, it becomes clear after a short sound sample that the actual speakers are below the front edge of the notebook. The sound output of the built-in speakers is quite good, with proper sonority and maximum volume. 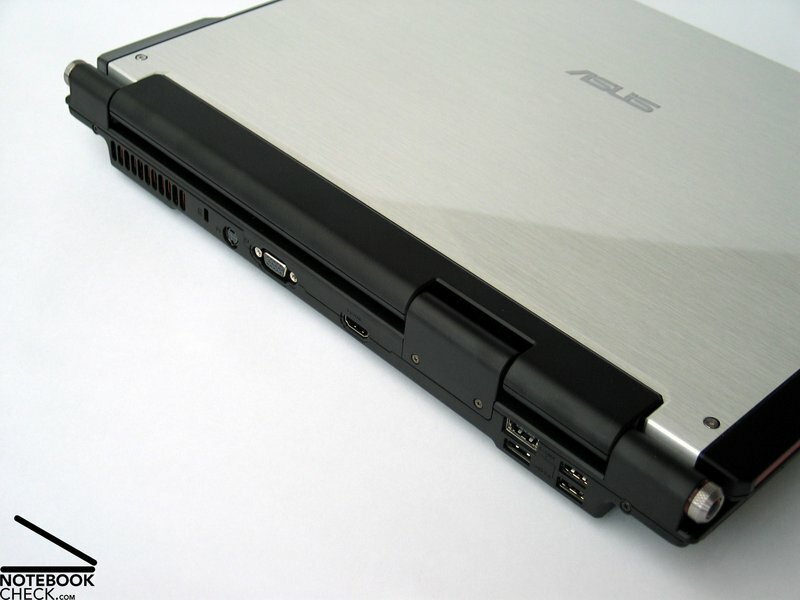 The Asus G2SG is equipped with a 4800mAh battery (71Wh), which provides mobile and power jack independent, but rather short use of the G2. The maximum battery life test with the BatteryEater readers resulted in 130 minutes life time. Under load (BatteryEater Classic test) the battery depleted in maximal 66 minutes. A bit disappointing is the battery life while playing a DVD: 88 minutes with a full battery is not even enough to watch an average movie. The Asus G2, in the model variant G2SG-7R014J, has generally the same strengths and weaknesses as it's predecessor models, but improved significantly regarding accessories (DVB-T tuner, turbo memory, RAM) and performance. 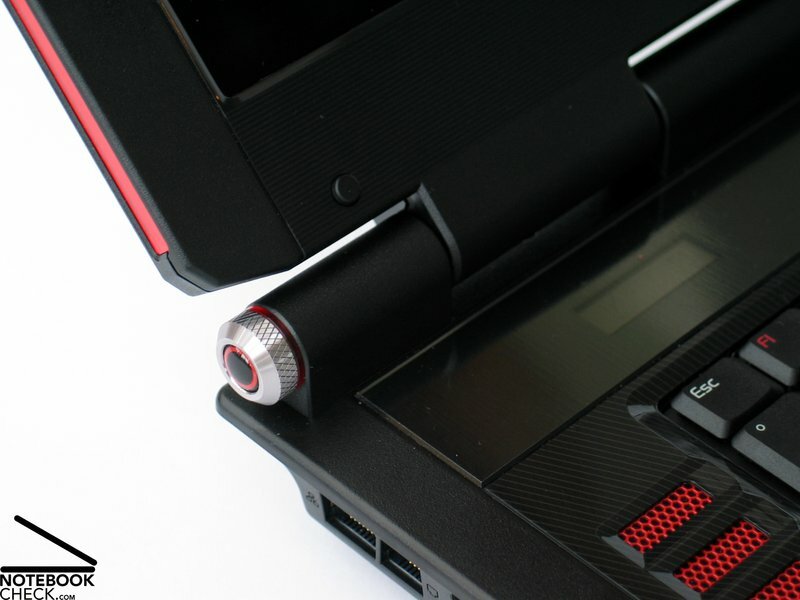 But especially the extensive accessories make the G2 still an attractive gaming notebook. 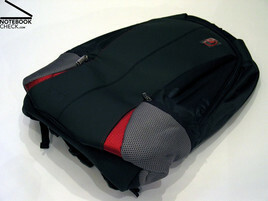 The outstanding case, with various colours and shapes, is probably not to everyones liking, but the fact that it is very stable and robust can't be disputed. The same can be said about the alignment of the interface connections. Whether they are located practically or not depends a lot on the habits of the individual user. 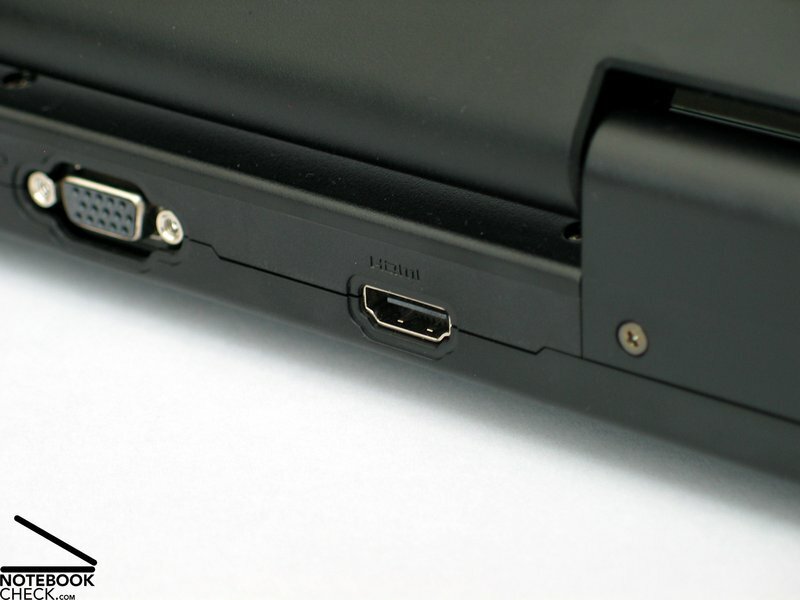 The HDMI port and the eSATA interface on the other hand should impress everybody. 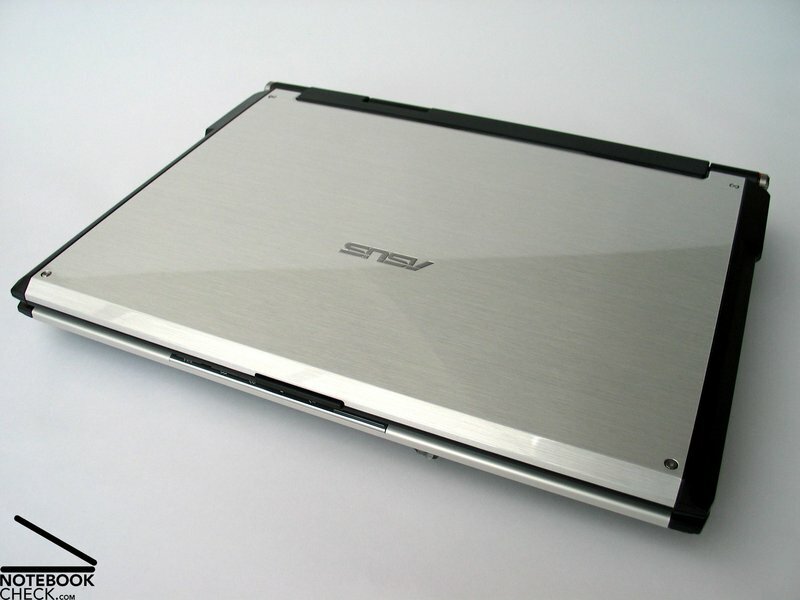 The display is another strength of the Asus G2SG. Like the predecessor models it offers excellent brightness of more than 300cd/m2 on average, and a very good contrast ratio. The resolution of up to 1440x900 pixel should be sufficient for gaming as well. Performance made a big step forward in the G2SG, due to the Intel Penryn processor and Geforce 8700M GT by nVIDIA. 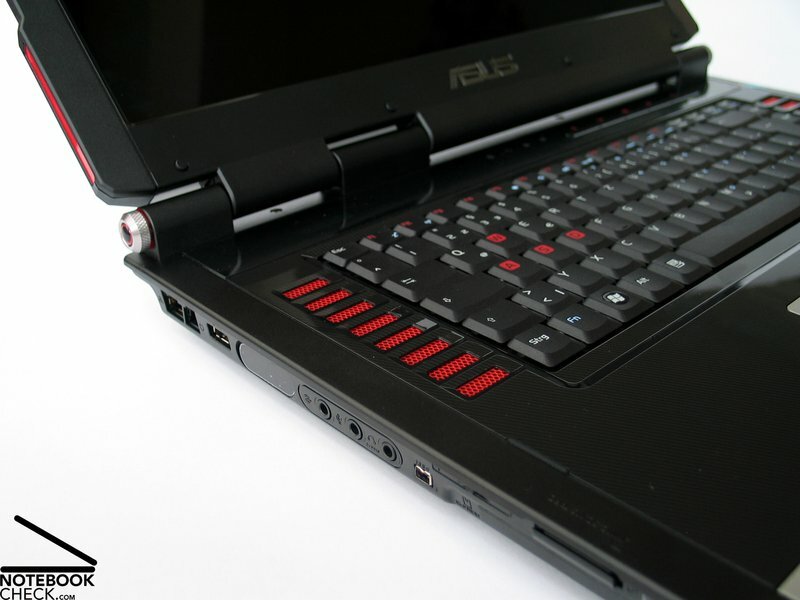 The Asus G2 offers thus good application and gaming performance. This is supported by the 4096MB system memory, the fast 320GB hard disk made by Western Digital and an integrated Intel turbo memory module. The notebook stays pleasantly silent in office mode, despite the performance gains. The fans only turn on under load and become rather noisy. 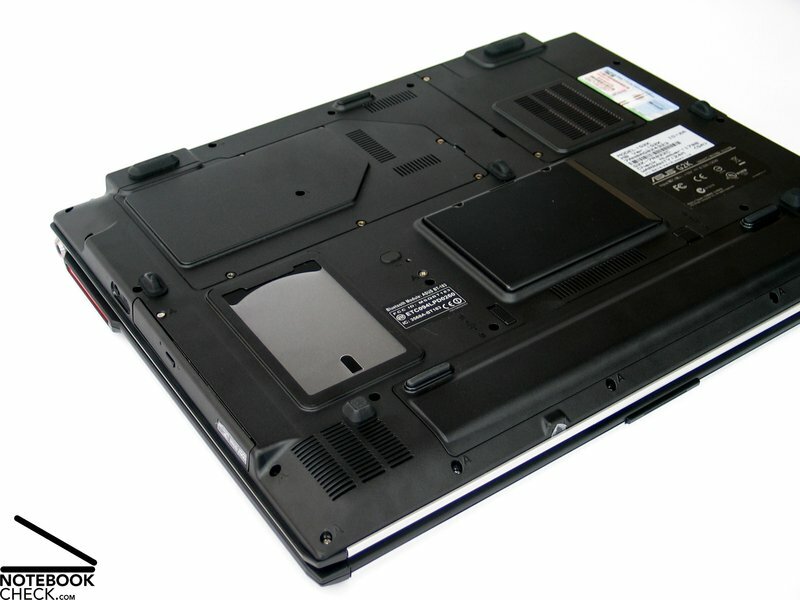 This is not a big problem for a gaming notebook however, since exciting games let the user quickly forget the fan noise. No changes were made regarding the heating up of the case. Especially the bottom side of the Asus G2SG becomes pretty hot with up to 50°C. This isn't such a problem, as long as the notebook isn't put on the lap. 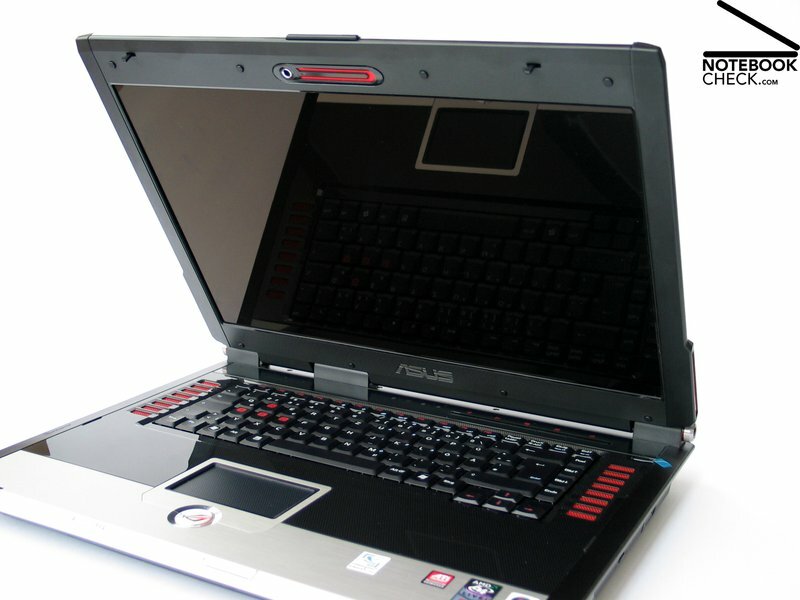 The G2SG is another model of the Asus G2 17 inch gaming series. 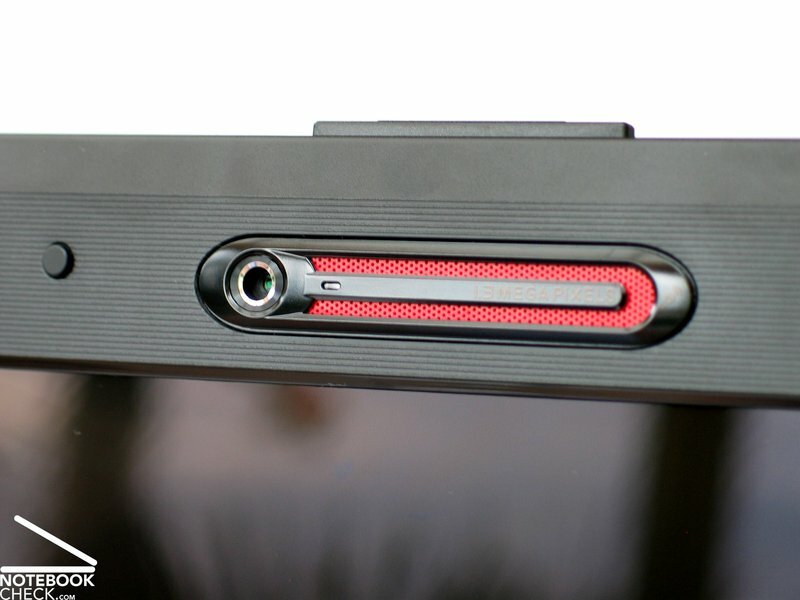 A 1.3 mega pixel web cam comes with the Asus G2 as well. The gaming keyboard is pleasant to use. ...is very bright and has a good contrast ratio. 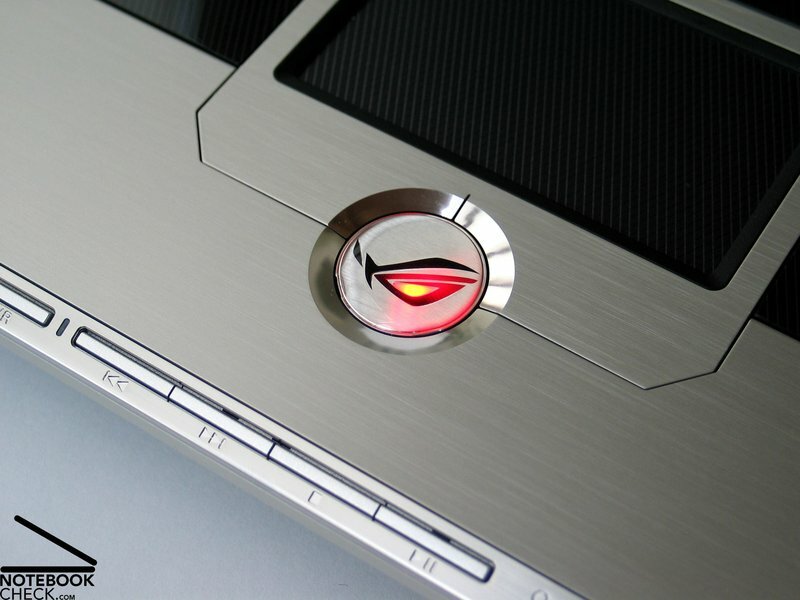 The G2SG uses popular Intel and nVIDIA hardware components. 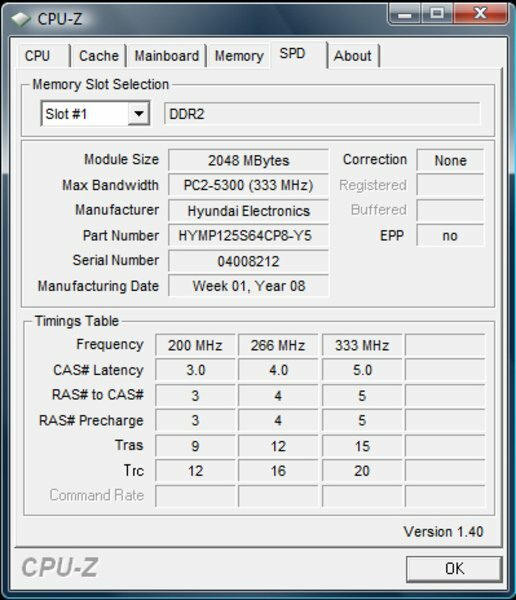 The Penryn T9300 processor and the Geforce 8700M GT achieve acceptable results in our test. The fan stays quietly in the background, most of the time. As a result, the case surface temperature rises to a maximum of 49°C. The built-in speakers offer good sound quality. Here one finds a HDMI and an E-SATA port among others. ...with the connections mainly at the back respectively left side. The same case is used as in the known models (G2P, G2K) and it shows the same distinctive design features. ...or the red light on the display edges. 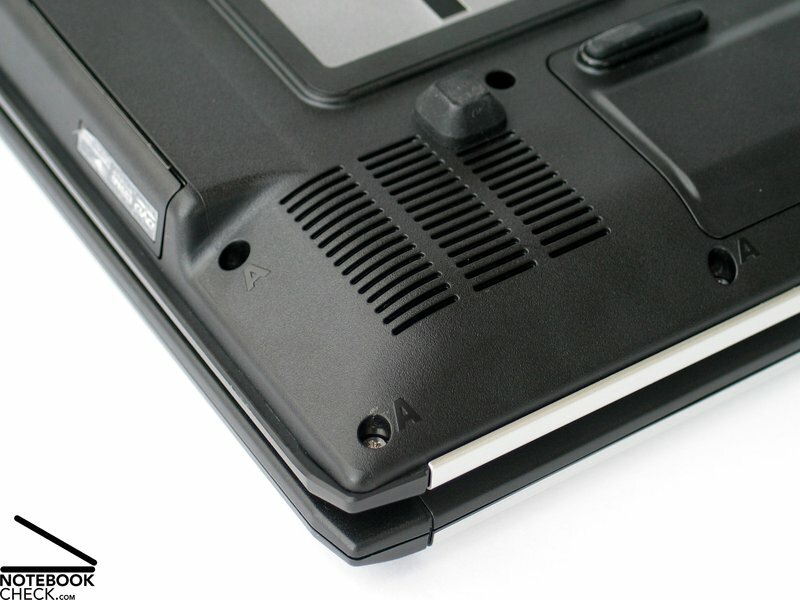 ...like for example the aluminum panel at the front edge of the notebook. ...with a weight of about 4kg is well crafted. ...do their job as well. 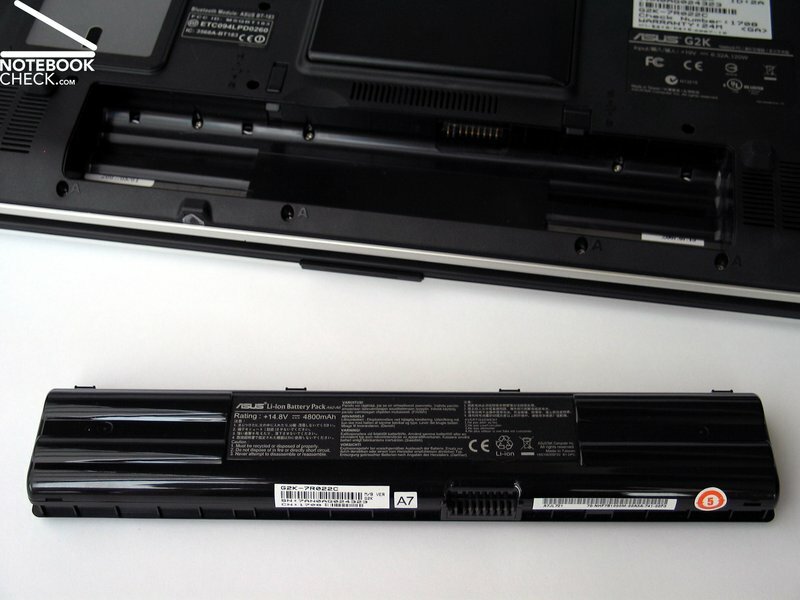 Although the battery life was not very long, it is acceptable for a desktop replacement notebook.